Yesterday was my niece's 8th birthday party and she invited me to come and do a jewelry demonstration and project. I was honored to be invited and thrilled that she was interested in what I do. But I accepted with a bit of trepidation. What could I possibly do with the girls that would be safe, interesting, and fun for more than ten minutes? I love making jewelry but I recognize that it involves a great deal of tiny, tedious activity. I find the repetition enjoyable and meditative but I am not eight. After considering several projects and rejecting each for a variety of reasons (toxic chemicals, too expensive, requires too much supervision) I determined on making silver domed pendants on spring-wire necklaces with beads. The pendant could be personalized by each girl and would allow them to see some metalworking processes that, perhaps, they had never thought of before. Then, they could string their beads with minimal supervision. I gathered all the materials and loaded up the car and headed over to my niece's house. The girls started arriving as I was setting up my gear. They ran about and jumped on the trampoline and were generally busy being little girls and I started to sweat a bit. How on earth was I going to get all of them through the project when they couldn't stay in one place for ten seconds together? The moms and I called their attention and I sat down at my bench and started to show them how to make the pendant. It was absolutely silent. They were gathered around my bench watching and listening to everything I told them about the materials and the tools and the reasons behind each step. The entire demonstration took about 15 minutes and they enthralled for the entire time. They asked really bright questions and were excited about making their own necklaces. 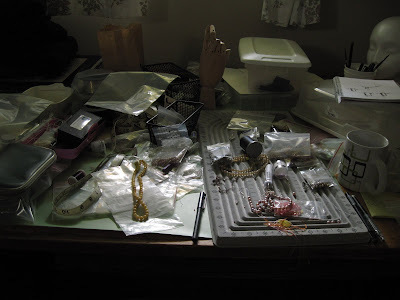 After I finished showing the pendant-making process, they went off to the worktable to string their beads. One at a time, they came over to the workbench and assisted in the making of their pendant. I had such a good time working with all of them. It is really refreshing to experience that bright interest of a child again and see the things that we, as adults, often take for granted or have ceased to care or think about. They embrace the process of creation with such enthusiasm and joy. They share their wonder and energy so willingly. My niece and in-laws kept thanking me for taking the time to do the project with them. But, really it was a gift they all gave to me, to spend the afternoon with the girls and get a fresh perspective on the nature of work and the joy of making things. I had a wonderful afternoon. Sometimes it is nice to make little clothes, just for fun. 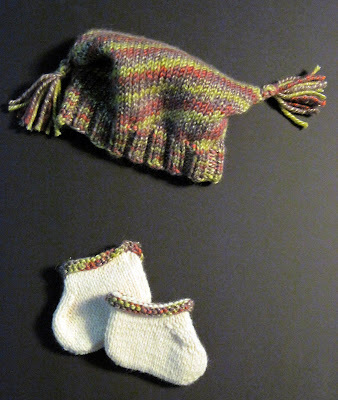 A little hat and booties for baby Nora made a good break from all of the over-analyzing that I do. I hope they keep her warm this winter. It is time to buckle down and clarify all of the ideas and plans for the fall. I am looking forward to teaching another semester of Metalwork and Jewelry Design but I am not without a certain amount of anxiety and jitters. I have so many ideas for the new class and I am really excited about the new and improved projects I am designing. I hope to have a group of students who will be as enthusiastic and hard working as students of past semesters. In addition to new classes, I am currently developing a blog with materials to supplement in class offerings. All of the possibilities for using the Internet to enhance teaching are becoming more clear to me, now that I have played around a bit in the blogosphere. 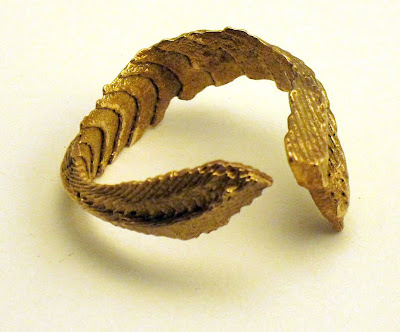 If you are at all interested in metalworking, I hope you will visit throughout the semester at http://jewelrystudio217.blogspot.com/. 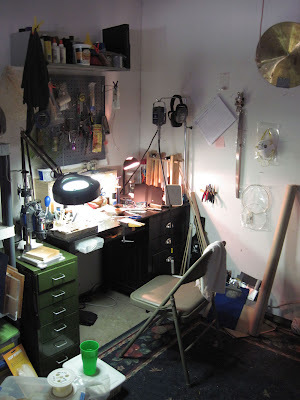 Although the material will be primarily directed towards my class, there will be links, tips, tricks and tutorials that will be of interest to studio metalsmiths and all are welcome. Offer more slide presentations in class. Create better projects that enhance student learning and encourage enthusiastic participation. Get more involved in my school and promote my course more effectively. Improve my in class demos. Effectively use the new blog to enhance learning and engage my students outside of the classroom. Successfully balance my professional development with my teaching responsibilities. Remember why I love teaching, every day that I walk in to the classroom. Having the opportunity to teach really is a blessing. Sometimes I lose sight of that in the bustle and worry about doing everything right. Teaching is not always easy but it can be very rewarding. I am fortunate to have had incredible teachers throughout my studies. I hope that I am successful in honoring what those teachers have given me by passing on the knowledge of my craft with integrity. Why does Eddy (the cat) beg volubly for food and then stick his head in the bowl so that I can't fill it? Why are there so many june bugs? As far as I can tell, all they do is hang out on screens and fly into stuff. Why can't Philip (the husband) close doors? Why do none of the socks match (we bought them all at the same time)? What is wrong with weeds, if they are green and pretty? Who decides which plants are weeds? Is it just snobbery because they are easier to grow than "proper" plants? Why is 10 minutes before my alarm goes off Media's (the cat) favorite time to deal with her hairballs? And why does it have to be right where I will step when I get out of bed? Does she have some sort of 6th sense about these things? There are more. Many more. What do you wonder about? Sometimes, I need jump rings. So I make a whole bunch. Sometimes I can't think of anything to make. So I make a whole bunch of jump rings. Well, I suppose I accomplished something. I will probably be glad I did this... later. I was watching Mirror Mask while eating my lunch today. I love that movie for its sheer exuberance. The richness of drawings and texture can be overwhelming, but in a good way. I find that I am often drawn to works of art that are an expression of liveliness and freedom. I love the work that appears beautifully unconcerned with correctness in the pursuit of an expression of feeling that surpasses the boundaries of the human mind/soul. It is passionate freedom that attains beauty that can be felt deep within the body. It is beauty that goes beyond verbal means of expression. It is a work of art that you can feel working deep within your body and it makes you remember that you are alive. It is a magic that I am always groping and searching for but rarely manage to find. My inner critic often manages to keep me in check. I find myself envying the freedom of others. We wrestle constantly, my inner critic and I. She is very vocal and cruel. She points out all of the reasons why an idea won't work. She finds one hundred possible avenues for failure before I have managed to put more than one line on a page. She lists all of the things that I need to get done and then mocks me for feeling overwhelmed. She is my worst enemy and, unfortunately, she is becoming me. I am going to get a mental rope and some duct tape... before she wins. Every time I hear the word Afghanistan on the radio (not terribly often), my insides clinch up a bit. It has, perhaps, been to easy to be complacent about the daily events on both fronts. The news of either war is buried deep within the news of the day. Most days, I don't even see a new article on either. They certainly are rarely on the front page. It is easy to assume that everything is okay. Even though my little brother is presently stationed in Afghanistan, he never really seemed so far away as he does today. With technology and communications so immediate, he frequently responds to emails and posts messages on his facebook page. It is not like in the wars that you read about, when you had to wait for weeks, or even months, for a letter. He is always right there. Maybe not answering the phone immediately, but close. Today, I am waiting and ready to hear that everything is okay. I suppose I am selfish. I should never have allowed the complacency of the media to become my complacency. How could I have allowed myself to forget about the dangers he (and each of the men and women serving) is facing? But I did. Today, I am waiting and hoping to hear that everything is okay. Well, I am completely cooked. In an effort to improve my photographs for my Etsy site, I decided to shoot outdoors. I am now thinking that it would probably be better to do this before noon as it was blazing hot on the back patio. The jewelry got so hot that I could barely touch it and (despite my extraordinary aversion to pain) I am not generally sensitive about picking up hot things. Those earrings pushed my limits. Here's hoping it was worth it! How wonderful, how very wonderful the operations of time, and the changes of the human mind!... If any one faculty of our nature may be called more wonderful than the rest, I do think it is memory. There seems something more speakingly incomprehensible in the powers, the failures, the inequalities of memory, than in any of our other intelligences. The memory is sometimes so retentive, so serviceable, so obedient; at others so bewildered and so weak; and at others again, so tyrannic, so beyond control! We are, to be sure, a miracle every way-but our powers of recollecting and of forgetting do seem peculiarly past finding out. Although the evidence of such creative chaos is inspiring... I think it might be time to clean my desk. I thought it was time to take a break from rings. 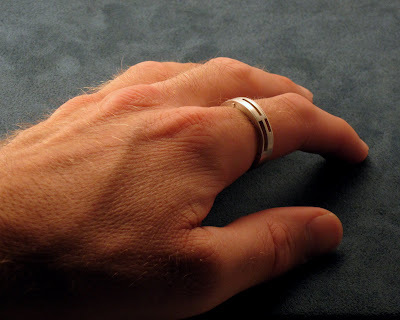 I have been making so many lately and spending so much time perfecting the riveted rings. 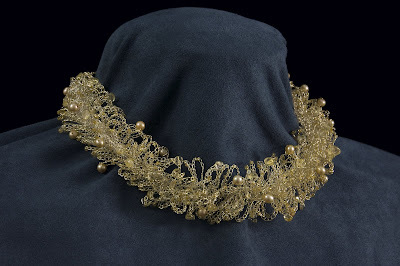 Today I worked on some "clasps" (for want of a better word) to continue a series of crocheted necklaces. The clasps are always so simple in my mind but, in the process of fabrication, tend to increase in technical complexity. Hooray for reality! 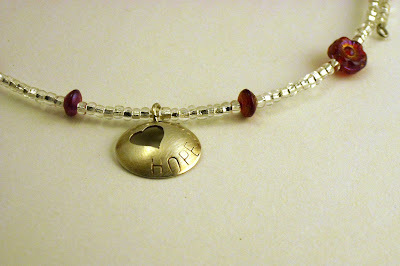 I am anxious to finish out the first clasp for a garnet necklace and am sorely tempted to stay up all night. However, I walked out to my studio space a moment ago and realized that the temperature is approaching broiler; I beat a hasty retreat back to the computer. Tomorrow is another day (and 6 a.m. arrives all too soon). It has been a good day and now it is time for bed. This is the end result of the two prior posts. 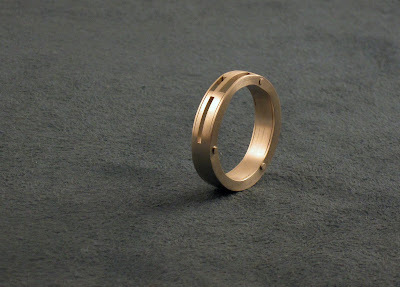 The "Ring for an Architect" is completed... in its first iteration. I have had this idea for a ring floating around in my head for-absolutely-ever. I have doodled it in sketchbooks and note margins and thought about it when staring vacantly into space. So, I finally sat down and modeled it in SketchUp (because, sometimes I actually enjoy fussing around on the computer). 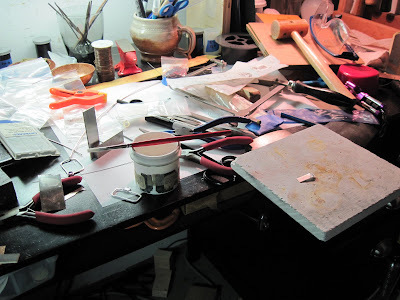 This is where the magic happens and, out of the semi-controlled chaos, the bits and pieces are formed into jewelry. 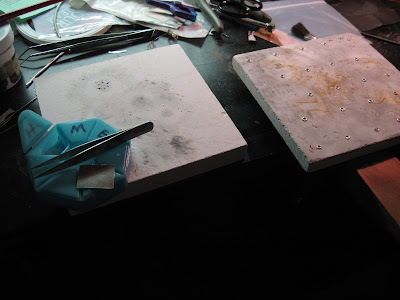 I spend the better part of most mornings and early afternoon between this desk and my soldering station. At least, until the Texas heat seeps through the doors and walls and chases me into my office. It is a happy place, where I can listen to my favorite music and work the hours away. The other day we had a crazy, crazy rainstorm; it was a sideways rainstorm that knocked down a branch and flooded the back yard. All of the stuff on the picnic table was blown away and we had branches from trees that we did not recognize all over the yard. 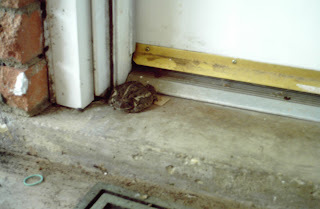 The next morning, this little guy was sheltered in our doorway. He usually lives in the hole next to the Carolina Jessamine but I guess his home got flooded. I gently prodded him with a twig until he hopped off into the yard (I didn't want him to get squished by the screen door). Hopefully he is dining well on all the flies that have been buzzing around and his home is cozy and dry. I think I will call him Jesse. It is good to have a toad as a neighbor. It is offical. I am really, finally on Etsy. I have my shop set up and posted my first items. Now it is back to studio so I can make some more. Hope you enjoy visiting my shop. Everything is moving forward. I am a few tiny bureaucratic steps away from being an actual business. My shop on Etsy will be open soon! I have finished several smaller projects and have several larger pieces on the verge of completion. It feels strange to finally move forward. I have been on pause for far too long, sitting here and making lists of all of the things I need to do and all of the things that could go wrong. Nothing really goes wrong, as long as you are doing nothing. Unfortunately, nothing goes right, either. So, I am doing something now. And it feels pretty good. The piece pictured above is called Lemon Fizz. I hand fabricated the necklace from fine silver, citrine, freshwater pearls, and delica beads and it is part of a series I am developing, inspired by desserts and candies.